Back in 2005 when starting the whole Current Classics Gallery, it struck me that three genres of bicycle were underrepresented - "Current" Classics, Cyclocross and Singlespeed bicycles. (Working Bikes came along a little later.) I figured that Singlespeeds would end up being mountain bikes for the most part and that Classics would be "road" bikes. Certainly, the definitions have changed since then - there is little in the way of topography and surface that I wouldn't take my "road" bike onto, and more people have begun to appreciate what a simple and appropriate drivetrain can do for their enjoyment of cycling. Nothing like getting on a bike and just pedaling to remind you of the ease and freedom of that first solo bike ride. Ritchey Mountain Bikes occupy a certain special place for me. It is (again) one of those bicycles I've always wanted but never owned. 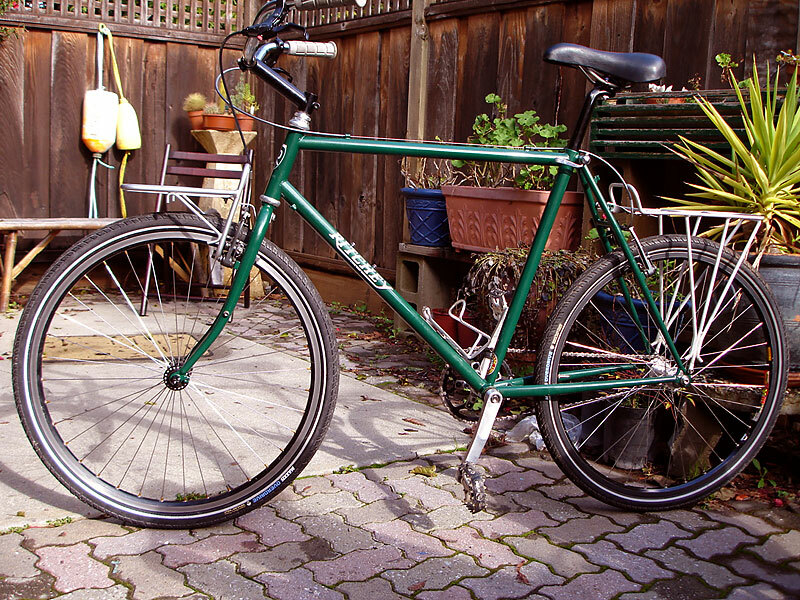 (Though my Gary Fisher Montare did state that it was "Designed by Tom Ritchey"). But, back when mountain bikes were oddities, I remember crossing paths with my friend Eric. He was zipping through town on his new Ritchey and the coolness of that bicycle cannot be overstated. Anything from the early days through the P-19's still catch my breath. The Outback comes from the initial period of mountain bike design when looooong wheelbases were favored, as the design blueprint grew from the Schwinn Excelsiors and similar models which hurtled down trails in Fairfax, CA (see SeeKay's site for more info on that period). There's something about these long frames which make them ride exceedingly smoothly and hold their lines in the sketchiest of terrain. That also makes them one of the more stable and comfortable bikes to ride on road. It's one of the reasons mtb's caught on so widely in places where there were no mountains. They were - wait for it - comfortable and fun. Like bikes are supposed to be. And so, what we end up with here is a Classic, converted to a Singlespeed, so that it can be used in a Work Bike role... blurring the lines between each with style.